DJ Khaled was supposed to headline Wireless Festival in London yesterday (July 8), but due to a "scheduling conflict," the fest announced at the last minute that he wouldn't be performing. Luckily, Drake stepped in to save the show. The Toronto rapper took over Khaled's slot and performed Scorpion tracks live for the first time, including "Nonstop," "Nice for What," "In My Feelings," "Mob Ties" and "I'm Upset." UK rapper Giggs also showed up during the surprise set, joing Drizzy for More Life cut "KMT." Of course, Drake also delivered other recent hits like "Walk It, Talk It" and "Look Alive." 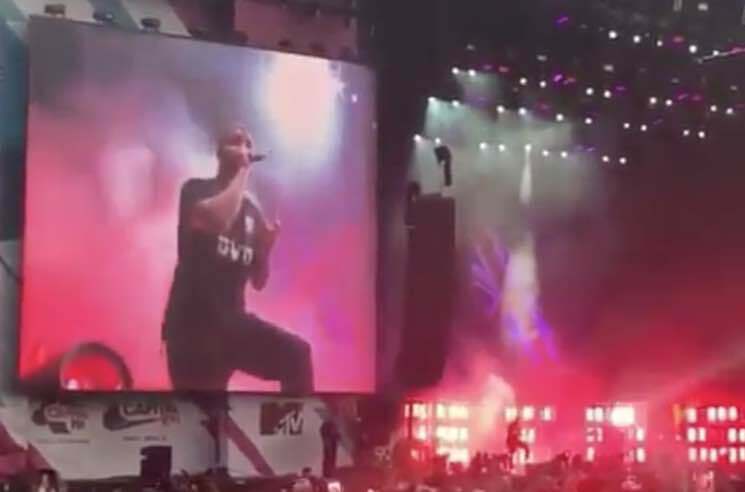 Watch video footage of Drake's Wireless Festival performance below. See his upcoming North American tour dates here. DJ Khaled Joins Forces with Justin Bieber, Chance the Rapper and Quavo for "No Brainer"